Swiss skier Joana Haehlen thought she had recorded her first women's downhill World Cup podium, until it was revealed three days later there was a problem with the electronic timing system. 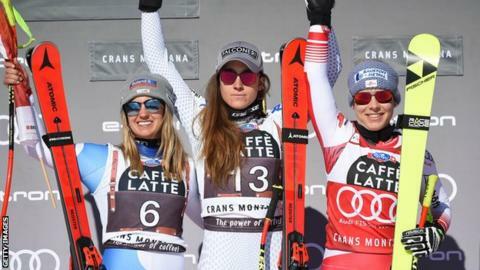 Haehlen was awarded second place in Saturday's race at Crans-Montana, but was demoted to fourth on Tuesday. The International Skiing Federation (FIS) said the times of four skiers were not recorded electronically. It occurred due to the photo cells at the finish being "mounted too high". The FIS said the manual times were then incorrectly calculated. In a statement, the FIS said it and Swiss Timing - a Swatch Group company in charge of timing operations on site for World Cup races - would like to "apologise to all competitors, teams, media and Alpine skiing followers for this unfortunate incident". The FIS added it was satisfied the official results were now "accurate and reflect the correct times of all competitors". Olympic champion Sofia Goggia remained as the winner, while Haehlen dropped from second to fourth and fellow Swiss Lara Gut-Behrami from third to sixth following the review. Nicole Schmidhofer was originally placed third before being demoted to fourth, only to be moved up to second on Tuesday, while Corinne Suter climbed from fifth to third.